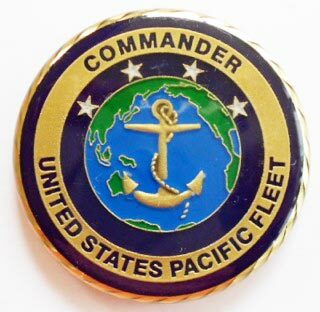 On April 9th, 2013, Kahu was presented with the United States Pacific Fleet Commander’s medal in appreciation for his support services in hosting the United States Navy Pacific Fleet Sea and Shore “Sailor of the Year” awards program held at Germaine’s Lū`au, on O`ahu. Eight males and two females representing the “Pride of the U. S. Navy Pacific” were chosen from over 140,000 military service personnel for their outstanding naval achievements. Each award recipient was welcomed in Hawaiian fashion with floral lei and individually acknowledged for their valuable contributions to the mission of the Pacific Fleet Command. The evening concluded with Kahu extending his personal congratulations to these fine sailors for their accomplishments and thanking them for their distinguished service to Hawai`i and our country. A total of 550 guests attended the affair.